Ever seen these at the grocery store? Buy them. 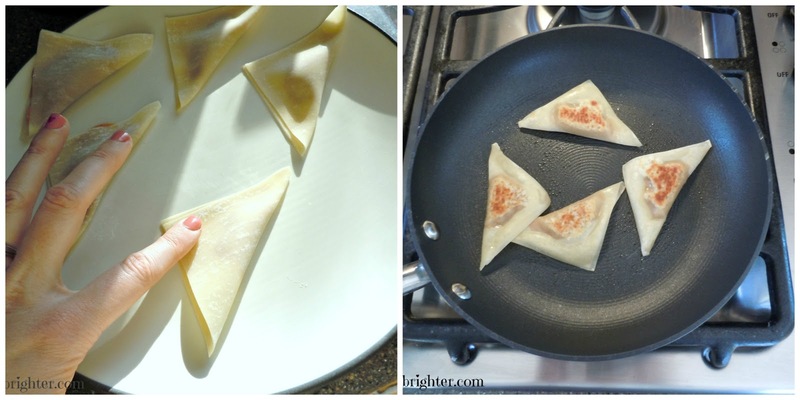 They are useful for so many meal ideas, like ravioli, egg rolls, and potstickers! After scarfing down Giada’s nutella ravioli last year, I saw this recipe on Hungry Girl & knew I had to try it. Ingredients look healthy enough, right? Wonton wrappers are sooo easy to work with. Find them in the produce section of the grocery store. You can bend them into different shapes & they stay put with just a dab of water. On a side note, they say your hands show your true age. I’m not actually 50, no matter what that photo up there says. Gah. Do not leave out the whipped cream, please:) It’s the perfect balance to the heavier pumpkin pie filling. And it really does make it taste more like pumpkin pie. Now that I’m staring at that photo, I remember that I ate these with my hands, after dragging them through the whip cream. Mmhmm. I’m off to apply some anti-aging hand cream. I must try these! They look delicious. They are, especially with the whipped cream!